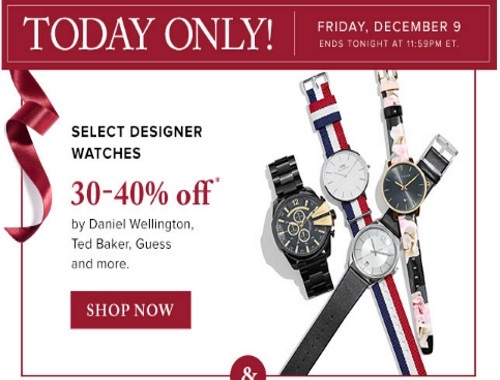 Hudson's Bay One-Day Sale today is 30-40% off select designer watches! This includes Daniel Wellington, Ted Baker, Guess and more! This offer is available today only, Friday, December 9, 2016. Also save an extra 15% off when you pay with your Hudson's Bay Credit or 10% off no matter how you pay with the promo code HURRY. This is their last extra savings before Christmas (valid December 9-11).